My father had frequently told me the story about how he purposefully gave me a Nigerian name, with the express intention that I would keep it, and not receive a new name as he and my mother did, upon confirmation in the Catholic Church. As a result, my parents’ names are Patricia and Ephraim, and I have a very Nigerian name, Ekpedeme. When I talk to my cousins they ask me what my “English name” is, and although I do have a nickname, Pamay, it came out of a child’s attempt to make it easier for friends, rather than the church’s attempt to replace a perfectly good Nigerian name with a church-approved confirmation name. I’m not even sure if this practice still happens – but it was a story I grew up hearing. So this article that I read in The Root was extremely interesting – it provided a window into how Catholicism came to the continent of Africa, the continent where my parents were born, and where my ancestors walked the earth generations and generations before. It talked about ” A forgotten African Catholic Kingdom,” but my life is full of African Catholics that I will never forget. My father loved the Catholic Church, and the Catholic service. He used to tell us all the time about how he used to be a choir boy, and how the Catholic Church really saved him when he was in medical school in Germany all alone. My father, a pharmacist from Lagos, Nigeria, had the opportunity to move to Germany and study to be a physician. He, being brilliant and confident, took the plunge. Once he got there, however, he experienced what many students do: a lack of funds, a little homesickness, and the challenge of completing a difficult course of study. Adding to his challenge was the fact that he did not speak German when he arrived on German soil. So he had to learn German and medicine at the same time. He never viewed anything as an obstacle. Along the way he did receive some help. As children, my sisters and I heard a lot about a woman named Christiana – a woman who apparently spent a good amount of energy making sure that my father was ok. Christiana was part of a Catholic family that realized that my father’s family was a pillar in the Catholic Church in Nigeria. When they met my father, and he shared his struggles, they responded with support. Why, she asked, should he starve alone? She made sure that she and the church provided him with the support that came in handy as he battled through medical school, graduating at the top of his class. My father accepted help in his early years, that he would give out again and again throughout his life. I remember when I was a self-absorbed teenager, and Christiana visited us in Atlanta. I didn’t know who she was, nor was I particularly concerned. I remember my father being very upset that my sisters and I did not act more interested in this woman who just seemed to be an old friend of my father’s. I tried to redeem myself when I, as a consultant for a large firm, lived in Munich, Germany for a year, and made the trip to Bonn, Germany to see my father’s university, The University of Bonn, and visit Christiana and her family in Bonn. More mature, I was able to see her, speak to her in my not-so-impressive German, and thank her for taking care of my father years before. I was touched when she showed me that she had all the letters that my father had sent her, including the one that he wrote her when I was born. She photocopied it for me and I still treasure it. Now she and my father are gone, but the legacy and the stories live on. Like my father, I too have learned to love Catholic mass – the liturgy and the ritual. I still haven’t mastered it all. Sometimes I don’t know what to say when during the mass, when to sit and stand and why – sometimes I get it right and sometimes I don’t. And in my efforts not to be a hypocrite, there are certain gestures I don’t make, mostly because I don’t know the depth of their meaning, and I wonder if others notice that I don’t partake. Catholic churches have been an awkward yet familiar worship experience, and on this Sunday, when I hear an announcement about a class to teach you how to learn to be a Catholic, I can feel my spirit saying “Whaddya think?” although I know that is not my path to walk. I have always been interested in the intertwining of culture, and religion, and history. Another experience I had during my first 52 weeks was going to a church in the Niger Delta area and attending a church that was conducted in the Okrika dialect, Kirike – the language of the Nigerians in the area. Just sitting there in that church, and understanding little more than “Jesus,” and “Amen,” I contemplated the movement of Christianity into the continent of Africa, and the intertwining of African religions and traditions with those brought by the Catholic church. This article taught me a little more about how that may have happened. 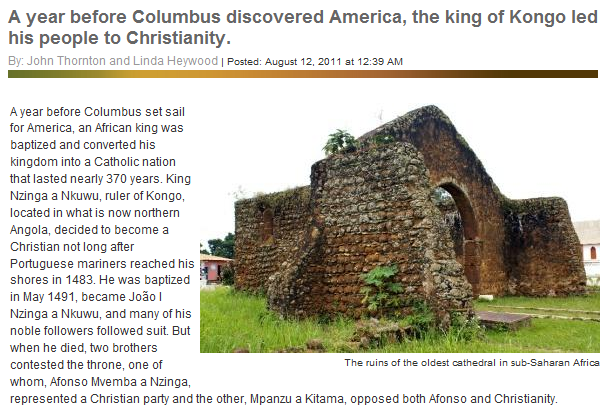 You can read the whole article at A Forgotten African Catholic Kingdom. « How strong are your beliefs? Do they inspire you to fight for victory while not compromising what you believe?